Hosting overnight guests? Treat them to a restaurant-quality brunch at home with this Overnight Caramel Pecan French Toast recipe! Looking for another option besides the standard breakfast bake to serve your overnight guests? While our tasty Fireman’s Overnight Breakfast Casserole is crazy popular, sometimes you want to serve something besides an egg casserole. 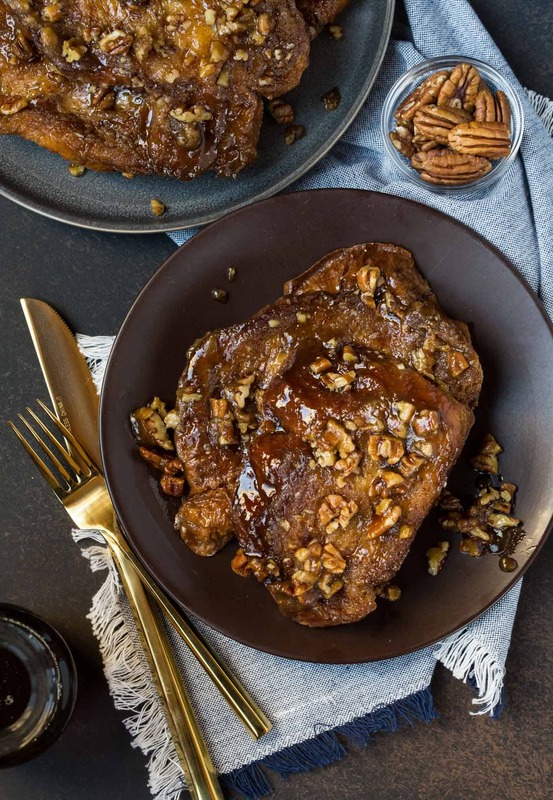 Look no further than this decadent Overnight Caramel Pecan French Toast recipe. Like waffles or pancakes, making french toast for a group of people can be time-consuming. 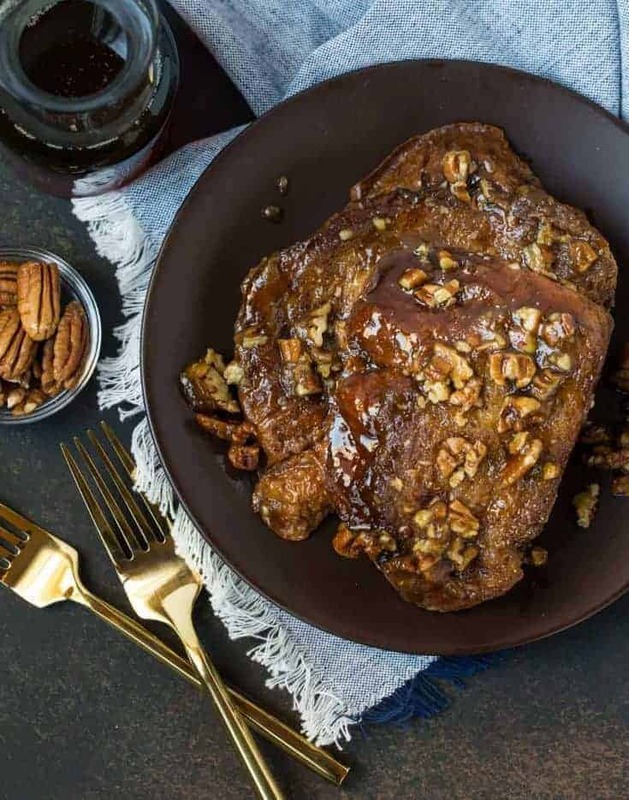 This Overnight Caramel Pecan French Toast recipe eliminates your need to stay chained to the stove during brunch by letting the oven do the heavy lifting for you. Though this recipe for Overnight Caramel Pecan French Toast is written for a large group, you can also easily scale it down for a more intimate gathering and it still works perfectly. Tip: Don’t have stale bread? No worries. Simply leave the sliced bread pieces on the baking sheet for a few hours flipping once or twice to help them dry out. Whisk together eggs, milk, cream, orange juice, vanilla, cinnamon, nutmeg and salt. Place bread slices in one layer on the largest sheet pan you have (a jelly roll pan is ideal). Pour egg mixture over bread slices, cover and refrigerate for 4 hours or overnight. Flip bread slices over halfway through soaking time or at least one hour before baking. Whisk together brown sugar and melted butter until thoroughly combined. Pour onto another large sheet or jelly roll pan, spreading evenly on the bottom on the pan. Place soaked bread pieces on the sugar mixture. Bake for 25-30 minutes or until the bread slices are golden brown and the sugar bubbles. If your bread isn't stale yet, simply slice and leave out on the counter for a few hours, flipping half way through. Can’t get enough french toast? We can’t, either! Here are a few more of our favorite recipes. O.M.G. I would be so excited to have this for breakfast I’m not sure I could even sleep the night before. This would be the perfect breakfast to wake up to on a weekend! You won’t need any syrup on this delish french toast. I love that this can be made overnight, and using brioche is the perfect added touch! This looks delicious! And while I like the IDEA of breakfast in bed, in reality, it just means you’d have to do laundry that day to get rid of the crumbs!